Hey there! I hope you are having a great start to your weekend. Today is Saturday Splurge and instead of writing about my planned topic for the day, I was inspired during something I was doing a little earlier and I decided that's what I wanted to share with you. It started out as a cloudy, rainy day, but the sky quickly became blue and sunny in the early afternoon, which allowed me to enjoy the day even more. Once I finished my lunch and our son was down for a nap my wife and I headed outside to the garden. 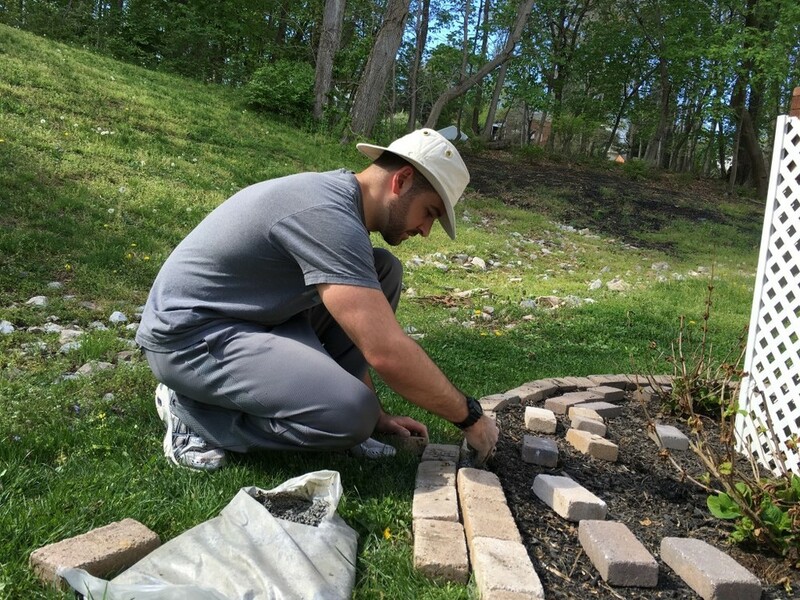 What started off as an ordinary homeowner "chore" turned into some "relaxing" and creative fun in the sun. Working with dirt in the garden and being connected to nature is very grounding and offers a unique calmness. Due to the sun and organic material in the soil, there is a lot of energy stored in the soil, which is released when you are working in the garden. The reason I was outside was to level the paving bricks around our flower bed out back. I have never done small time "hardscaping", but I was up for the challenge. I mean, how hard could it be?? Well, it turns out -- it was pretty easy. However, it kept my mind focused on what I had do for awhile. That was nice because it was a simple and fun, plus I was getting plenty of sun and fresh air. I don't know about you, but I've always enjoyed nature. Just watching and observing animals, insects, whatever it is. I always feel a sense of calm and peace being around it. We live in such a face paced world today that it's important to find something that allows you to slow down and TRULY feel a sense of peace. You can find so much joy in those moments that it makes it worth even just 10 minutes in that state. However, I had to stand up periodically because my lower back was reminding me that I wasn't keeping it in the most ideal position. I will get some good stretching and mobilizations in tonight while laying on the floor. It's important to keep the body loose and mobile, especially after staying in any one position or a good amount of time. So, I encourage you to experience spending some time in your garden or just the dirt with nature and all of the wonderful energy it has to offer. It can also serve as some great activity for the day, as most gardening is very physical. Please share your experience either in the comments below or message me HERE on Facebook... I would love to connect with you there as well. Enjoy your weekend! Older PostWant something besides eggs for breakfast?